The human body (like other living organisms) is a complex, multi-level symbiosis of parts. The most basic constituent of any organism is the atom, because atoms make up chemical molecules. In biology, molecules can be of an astonishing and enormous complexity. Molecules join to make cells, which in turn make up tissue, such as skin, bone or muscle tissue. Tissues comprise organs, like the heart or liver, which are grouped into systems, such as the nervous or digestive systems. The systems in turn make up the organism. All those different levels of organization add up to a very complicated and highly organized system. Organisms are maintained in working order by a group of processes called metabolism, the set of all the chemical reactions which take place in the body in order to ensure life, including the maintenance of homeostasis. Homeostasis is the environment necessary to ensure proper functioning. It includes temperature, blood pressure and glucose level. At the same time it maintains the ordered state of the body, this energy is fighting against entropy increase in the body. In doing so, it is increasing the entropy of the universe. Food entering the body is highly organized, so in a state of low entropy, whereas waste products are in a state of much higher entropy. Also, much energy is dissipated as heat, as in any machine. Catabolism is the breaking down of large molecules into smaller ones, a good example being the breaking down of food molecules to obtain energy. In general, a larger number of molecules tends to be more disordered and so catabolic reactions tend to increase entropy. Anabolism is the opposite of catabolism, so it is the combining of smaller molecules to produce larger ones, such as the formation of proteins from amino acids. Anabolic reactions tend to decrease entropy locally. the energy of the reactants is greater than the energy of the reactants (ΔG > 0), so the reaction is endergonic and does not occur spontaneously. Such organization is quite unlikely and is therefore in a state of very low entropy. The struggle against increasing entropy (disorganization, like decay) requires the addition of significant amounts of energy. How does this take place? Movement is a form of energy (kinetic) and everything which moves (steam engines, electric motors or animal muscles) requires input of the energy it expends – and more, since some is lost as heat. Animals get their energy from the nutrients they ingest – food. Plants are autotrophs, meaning that they make their own nourishment, converting energy from the sun into mostly carbohydrates, which we can then eat. Humans are heterotrophs, “hetero” meaning “other”. We must get our nourishment from others, meaning plants and other animals. On a global scale, energy transformations are cyclic. Sunlight strikes plants and, in doing so, provides energy to power photosynthesis which produces carbohydrates from CO2 and water. Some of these are eaten directly by us and some indirectly, as we eat the animals which have consumed the plants (or other animals which have…). Our digestive system and cells convert what we eat and breathe into usable energy. Our waste products include CO2 and water, which are then reused by plants. The details go way beyond this overly simple illustration, but the idea is the same – a cycle of substances through plants, then animals, then back to plants, and so on. But the initial solar energy is eventually re-radiated into space as heat and is lost. New solar energy must continually be pumped in to keep the cycle running, in accordance with the Second Law of thermodynamics. 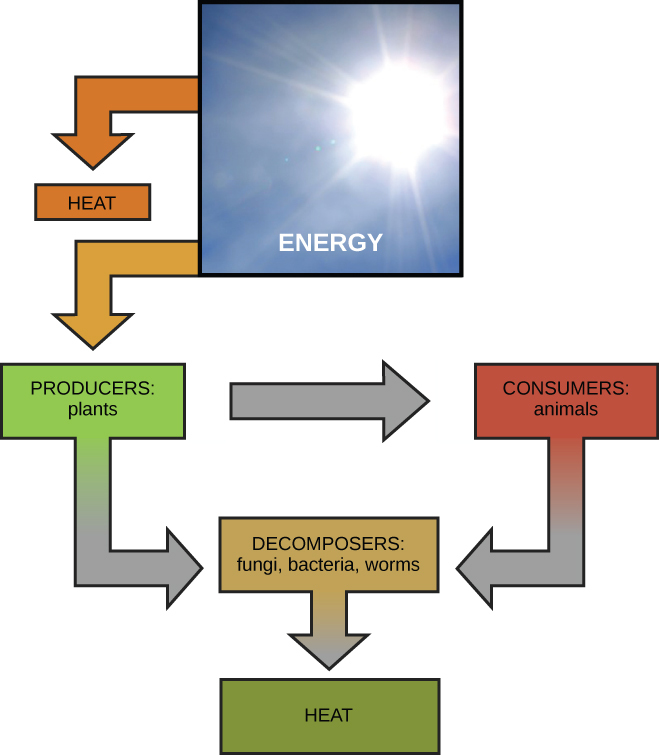 Two main energy input paths exist in the human body, respiration and diestion –air and food. Oxygen is distributed by the circulatory system. When we breathe, air enters through the nose, then passes through the pharynx, the larynx, the trachea and the bronchi and into the lungs. There, it passes into the alveoli where oxygen is transferred to the blood which has been pumped into the lungs from the right ventricle of the heart through the pulmonary artery. 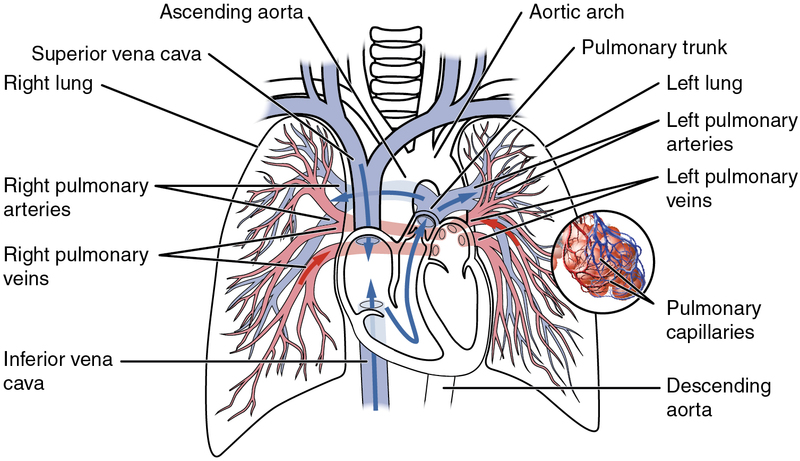 After oxygenation in the alveoli, the blood is pumped through the pulmonary vein[ref]The pulmonary veins are the only veins to convey oxygenated blood, so it is convenient to think of veins as conveying blood toward the heart. [/ref] into the left atrium of the heart, then out from the left ventricle through the rest of the body’s arterial system finally passing from tiny capillaries into the cells. De-oxygenated blood is pumped back through the veins into the right atrium of the heart and then the process starts over. The blood circulates all kinds of things, not just oxygen. For instance, it carries products of digestion such as glucose to the cells and removes waste products. The second energy-input pathway, digestion, takes place as food enters the body through the mouth, where it is partially broken down (hydrolyzed) by enzymes and chewing. It then passes through the pharynx and esophagus to the stomach and intestines, where it is digested by various processes using different enzymes depending on composition (carbohydrates, lipids or proteins). The result is principally glucose, which enters the blood from which it may be used immediately or stored for later use. 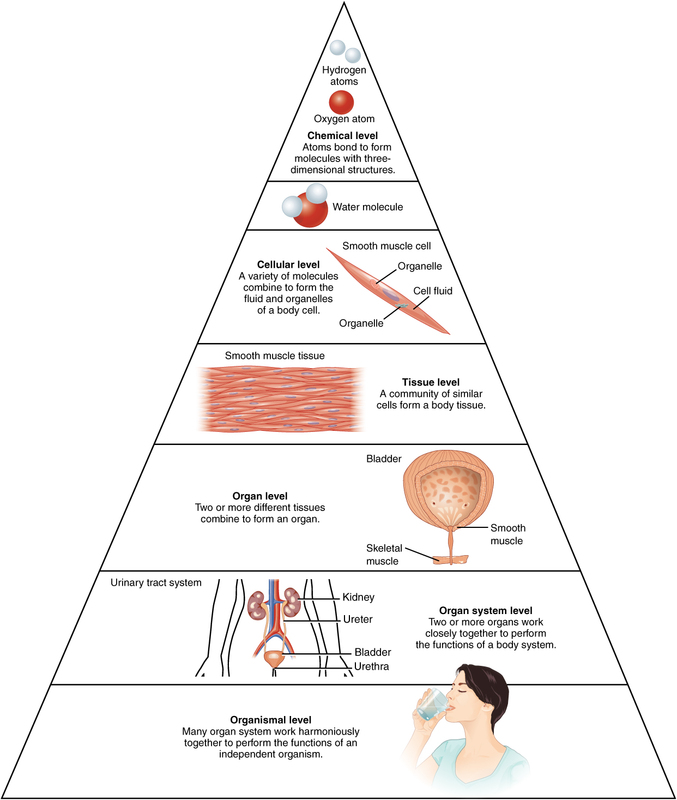 When the cell needs energy, a series of processes called cellular respiration takes place, mostly in the mitochondria. Glucose from digestion is combined with oxygen from the lungs to liberate energy. This is the fun part! What happens is this. This is where the two input paths come together. Glucose from digestion is combined with oxygen from the lung to make water, carbon dioxide and much energy. It is glucose catabolism, or breakdown. The liberated energy supports metabolism. Next chapter, energy input through digestion.